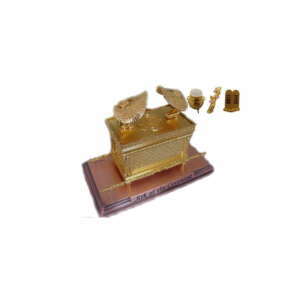 The Ark Of the Covenant – Table Top Replica measures 2″ by 1.50″ by 1.10″. Base Size 4.40″ by 2.20″ or 5.09 cm by 3.8` cm by 2.54 cm. Base: 11.12 cm by 5.6 cm. The Ark of the covenant contains Aaron’s Rod, stone tables with the 10 Commandments on (Deuteronomy 31:26), and a golden pot that contained manna bread.